Infographics are works of art. Just like how it takes years of hard work and effort to master the work of each individual artist in the world today, the same can be said for graphic and infographic designers. 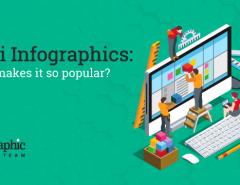 While the concept of infographics may seem direct in their nature, the actual design process and foundation work to get there is quite in-depth. Today we will walk you through the process of how we take client’s ideas and turn them into visual masterpieces. This same process takes place whether our design team is working with you clients to create Infographics, Social Media Graphics and Presentations. The more you know (as a client) about the type of design and content you want included and your target audience, the better we can pull everything together to create exactly what you are looking for. Here’s a glimpse of how the process works. 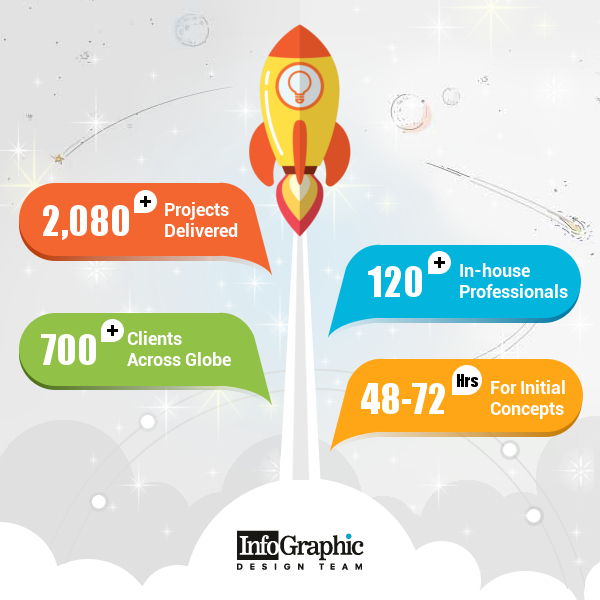 The first part of the process is to take a look at the many different design services offered by InfographicDesignTeam. 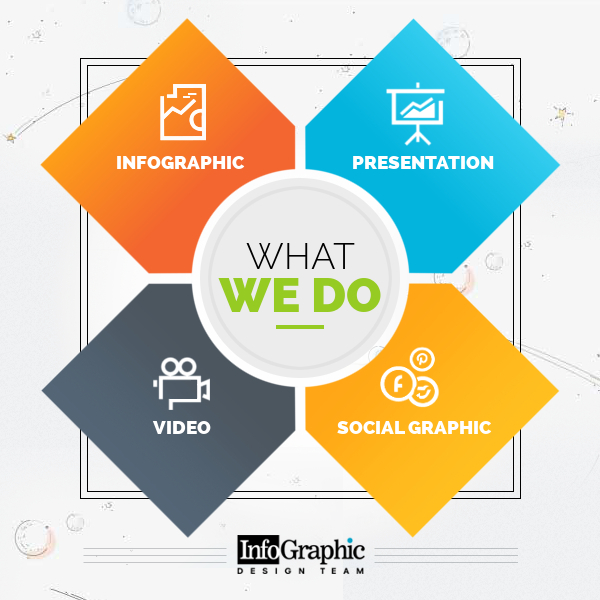 While we have ‘infographic’ in our name, we also specialize in a wide range of graphics, such as video infographics, social media graphics and presentations. You can see a full description on each of these design services here. 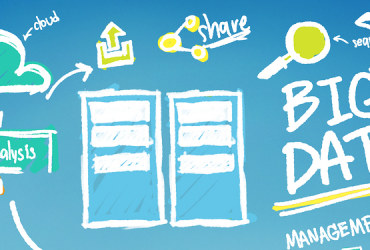 INFOGRAPHICS – An excellent way to bring your content and data to life through visual imaging. Infographics are also a great way to share your content online, while also making it a lot easier for your data and brand to go viral in the process. PRESENTATIONS – Nearly every brand or business needs to use corporate slides at some point or another. Stand out from the crowd by having your own custom presentations designed with your logo and branding. SOCIAL MEDIA GRAPHICS – There are currently over three billion people spread across the major social networks. Show off your brand and expertise with a custom header, profile and fan page image. Such images can be created for Twitter, Facebook and most social profiles that allow for customized images. 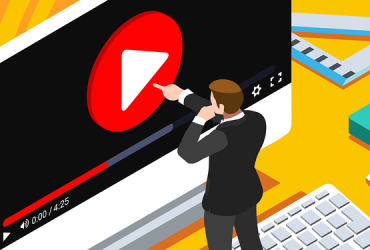 VIDEO INFOGRAPHICS – Infographics are wonderful, but if you would like to fully maximize your infographics, data and branding, you should also consider converting your existing infographic into a video as well. 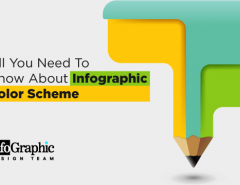 Before starting on how to make infographics, we must first have a quick discussion on your design concept and to go over any ideas you are looking to have created and the best way we can accomplish that. These discussions are usually done through email, as we begin requesting client and project information at the time of ordering. A great way to see what design projects are possible with LogoDesignTeam, is to take some time and look through our design portfolio. Here you will find hundreds of examples of infographics, social media graphics and presentations from a wide range of previous jobs and clients. To get started with this initial discussion, click here to review our design packages. With your design order now placed, it’s time for our design team to start throwing a few concept ideas together for you to consider. The great thing about working with a brand like LogoDesignTeam, is that every project is handled with extreme care and our team of highly proficient designers know exactly how to turn your existing ideas, data and content into engaging visual content. After looking through your initial design request and questionnaire responses, our design team will follow up with you on the design concept process to make sure everyone is on the same page. The next step in the process is to review the initial concepts that our design team have created for you. This usually is done within 2-3 working days after your order has been placed and all brain storming ideas have been confirmed. The initial design concepts will allow for you to see a visual of the work in progress and the direction your graphic is headed. Right now if the best time to provide any feedback or adding in any additional data points or recommendations for the work. All of these customizations and design tweaks will continually be worked on until the client is completely satisfied with the final project. Communications with our design team can take place through email, Skype or telephone. Once the client’s work has been completed, our team will follow up and send you the final set of image files in .AI or any other specific format requested. Should the client find that the design turned out to be exactly what they were looking for, they can follow up with a testimonial (which can be featured on our site) and their design can also be featured within our portfolio gallery as well. Now that you have an idea on the exact design process that takes place when someone orders an infographic design through our site, why not place an order for one of your own? The greatest thing about infographics, is that we can take any data segments or content you already have, then we bring it to life through visual design. 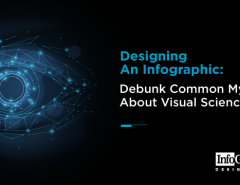 It’s not until after a brand or organization has created and released an infographic of their own, that they have truly realize the power of visual data and see how it gets shared across the internet. With as much content as there is on the internet today, it’s now more important than ever to deliver the best information in the shortest amount of time as possible. Posting articles with thousands of words of text is no longer the most effective way to get your brand and messaging out there — now it’s all about visual marketing and using infographics to deliver that message. To get started with an infographic design of your own, click here to contact out team and we’ll gladly walk you through the same design process as we’ve laid out for you above.